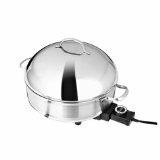 Leyse Electric Fry Pan Buyers Guide. SummaryDuring cooking the stainless steel handle gets hot, so you need to use a pot holder. The upside is that the handles will last forever.